During the College years I had programmed an Alec Guinness retrospective, and after some considerable correspondence the reclusive actor kindly agreed in 1990 to introduce originally his ‘Horse’s Mouth’, but on arriving damaged, this was replaced by ‘Tunes of Glory’ (1960). 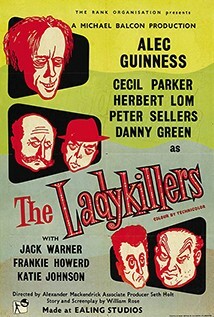 Neither are available to license, so we are screening another Guinness classic from Ealing studios, ‘The Ladykillers’ (1955), to celebrate these special occasions. He graciously returned to introduce a favourite non-Guinness film in 1996 just before his death. – Roger Gibson. Classic Ealing comedy in which a group of bank robbers struggle to silence the eccentric old lady who discovers their crime. Mrs Wilberforce (Katie Johnson) lives alone in King's Cross with her parrots. She has been led to believe that the group of men renting rooms from her, Professor Marcus (Alec Guinness), the Major (Cecil Parker), Louis (Herbert Lom), Harry (Peter Sellers) and One-Round (Danny Green), are classical musicians. The joint best (with ‘Kind Hearts and Coronets’), if not the best of the Ealing Comedies, this is darker than usual, a real black comedy (but unusually in colour), written by David Rose and directed by Alexander Mackendrick. With a superb performance by Alec Guinness obviously giving a nod to Alistair Sims. And that supporting cast!